A few years ago, my sister casually told me about a roast chicken she had made for her now husband, then either boyfriend or fiancee, depending on just how many years ago this was. I really can't remember those specifics, because honestly they are less important in my memory than the story I was told about an amazing, crispy, spatchcocked chicken that had been plopped on a broiler pan and roasted to high heaven while the fat rendered down onto a bed of potatoes cooking below. I mean, HELLO. Who cares about how your sister is currently DTR-ing when you have that to think about? However amazing this chicken was, Claire never made it again, because she deemed the indulgent, fat basted potatoes to be a once in a lifetime treat not to be repeated for the sake of her and Ryan's arteries. I never made it because I don't own a broiler pan. And this chicken might have remained in the annals of "Remember That One Time I Made That Thing" if not for my quest to cook all the chickens and my subsequent realization that that might just be too much chicken for one person. So, I asked her to make it. Because she still has a broiler pan and who cares about heart health when I have blog content to produce? To be honest, it didn't really take much convincing, and as the conversation turned into a discussion of how this could possibly be made better, one of us must have mentioned buffalo sauce and now here we are. As best I can tell from afar, a little bit of prep work on the chicken, a broiler pan, and a willingness to embrace all the new "We Can Eat Fat Now!!" headlines results in a crispy, quickly roasted bird that is flavored with just the right amount of hot sauce. Add in the delicious side-effect of fat-roasted sliced potatoes and a ranch dipping sauce, and the whole thing comes together into a familiar picture that has somehow been elevated away from your local dive bar into the center of your dining room table. Now, let's chat a bit about spatchcocking. I was very relieved that Claire's second contribution would be tackling the spatchcocking method, because I've never done it, and while it seems simple enough, I was grateful to have more experienced hands handling it for TRCP. Spatchcocking is just a fancy name for removing the backbone from a chicken (or turkey) and then breaking the breastbone to flatten the chicken. What this does is increase the surface area of the meat exposed to the heat, increasing the amount of crispy skin, and also considerably shortening cooking time and helping to ensure that the white and dark meats cook more evenly. It's genius, really, but it does require a good pair of kitchen shears and zero fear of raw meat. If you don't have either of those things you can just ask your butcher to do it, but make sure you get that backbone from him! It's great for stock! Claire says, "Buffalo chicken + roast chicken. Two of my favorite ways to eat chicken. Plus bonus crispy, almost potato chip-like roast potatoes. All I have to say about this recipe is that you’ll have dinner on the table in one hour (amazing when a whole chicken is involved!) and it’s classier than a plate of wings, but just as good!" Preheat the oven to 500 degrees. While the oven heats, melt the butter, either in microwave or on the stove. Stir in Cholula, garlic powder and dried oregano. Add salt and pepper to taste. Set aside. Line the bottom of the broiler pan with aluminum foil. Brush with 1 tbsp olive oil, and scatter sliced potatoes in the bottom. Sprinkle with salt and pepper. Replace the top of the pan over the foil-lined bottom. Butterfly (spatchcock) the chicken. See tutorial below (You can save yourself a messy cutting board and do this on top of the broiler pan. It’s all going in the oven together anyway!). Lay the chicken breast side up on top of the pan. Loosen the skin over the breast and thighs. Using a spoon, spread the buffalo sauce under the skin as best as you can, reserving 1 tbsp of sauce. Spread the remaining tbsp of sauce over the outside of the skin. Sprinkle with salt and pepper. Roast the chicken and potatoes for 20 minutes. After 20 minutes, rotate the pan in the oven, and roast for 20-25 minutes more. 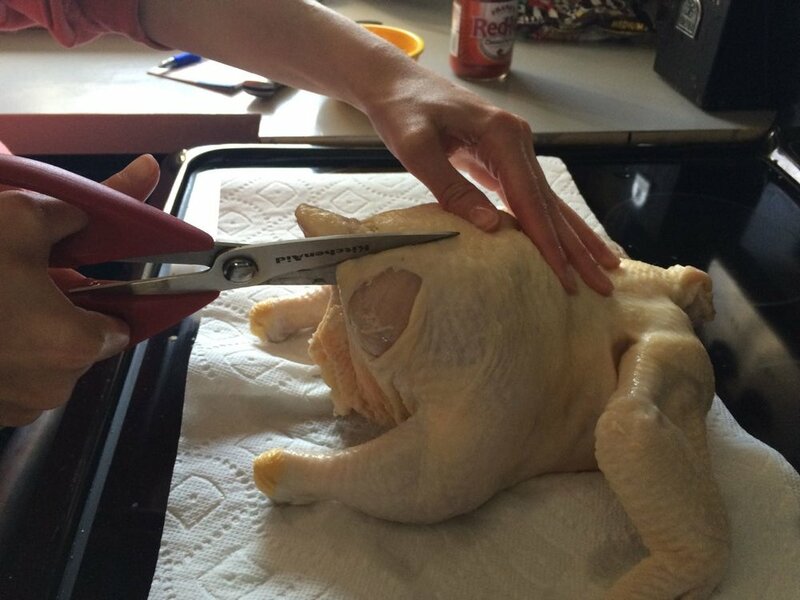 The skin should be brown and crispy. 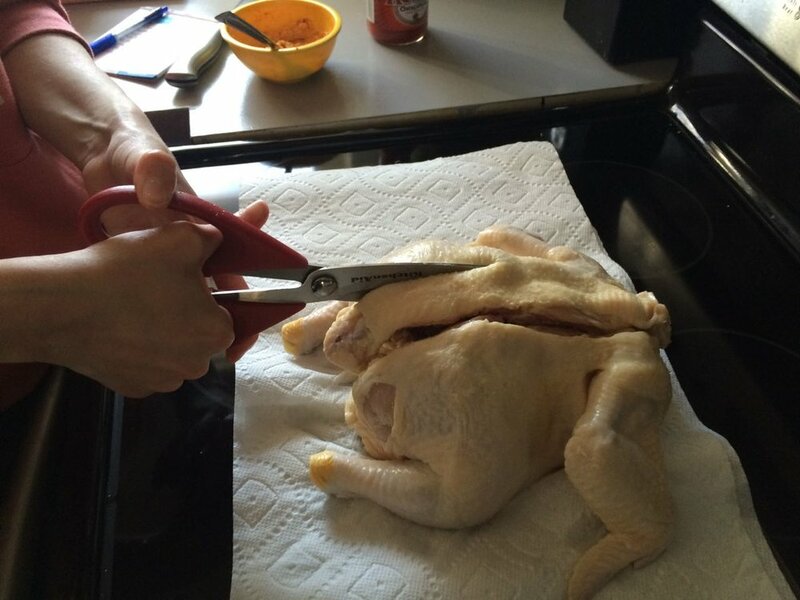 Set the chicken aside on a cutting/carving board to rest for about 15 minutes. Remove the lid of the broiler pan, and blot the potatoes with paper towels or a clean dish towel. They will be very greasy. In a small bowl, stir together the yogurt or sour cream with 1 tbsp of the chopped chives, the thyme, the minced garlic, and onion powder. Add enough water to thin to a saucy consistency. Add salt and pepper to taste. In a large bowl, mix together the remaining 1 tbsp of chives, and celery seed. Place the potatoes in the bowl, and toss until well seasoned. Carve the chicken into pieces, and serve with potatoes and ranch sauce (and a vegetable or two, if you want to make up for all that butter and chicken fat). 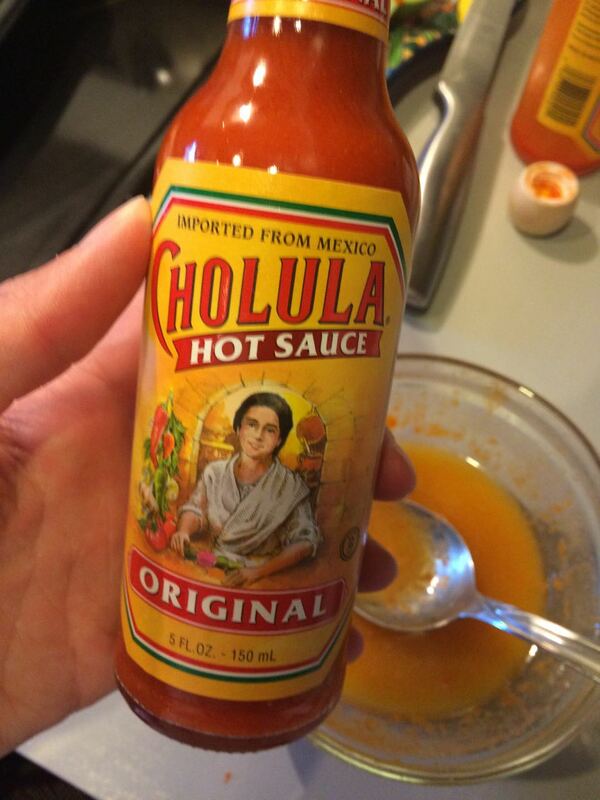 I do recommend you try to find the Cholula hot sauce. It’s just spicy enough, while being less vinegary than Tobasco, and less salty than Frank’s. 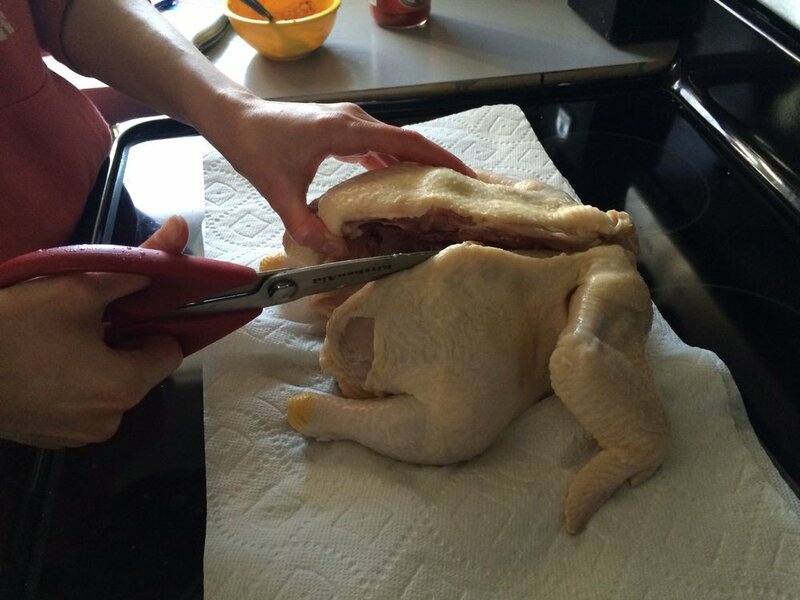 Place the chicken in front of you, breast side down, with the tail end facing toward you. Feel for the edge of the backbone on either side. Using kitchen shears, start cutting along the edge of the backbone, moving toward the neck, until you cut through the entire edge of the backbone. 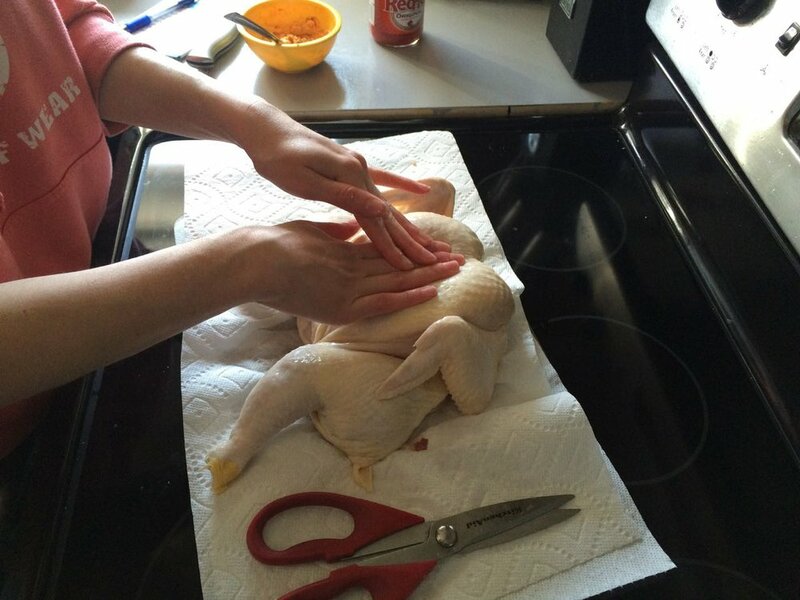 Turn the chicken over, and press down on the breast. Use your body weight to really press down, until you feel the breast bone break. 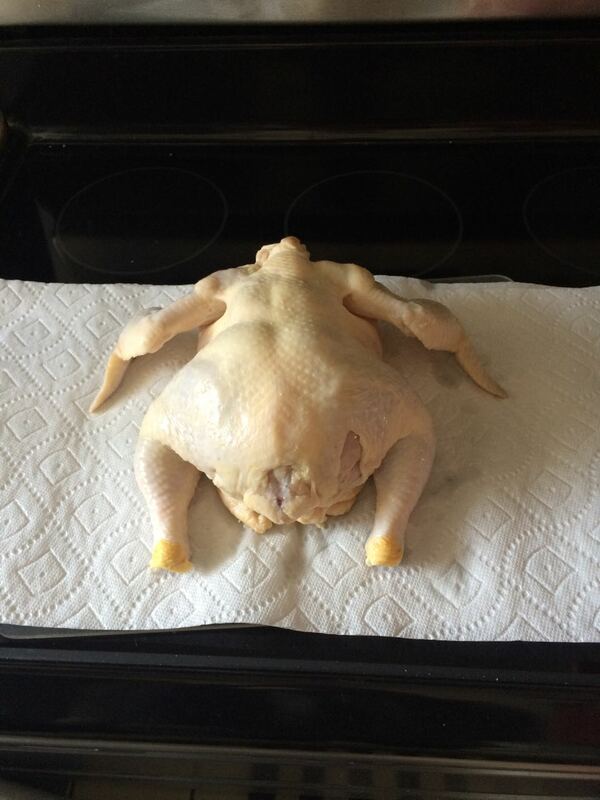 The chicken should lay flat at this point. If this seems like too much for you, ask your butcher to do it for you!